Why are men so hard to shop for? Like really? It's like, you could literally buy me almost anything right down to a pair of socks and I'd be happy. But men... so hard! I've been working hard on the ultimate list of gifts men actually want this Christmas, and I think I did pretty good. I even ran it by Brandon to get his ok. Some of these are gifts I have bought Brandon in the past, but some of them are items that I never would (i.e beard kit) but I know other men in my life (like my nephew/brother) would love. I'd got everything from stylish clothes, to tech gifts, to gifts for the chef or bartender. 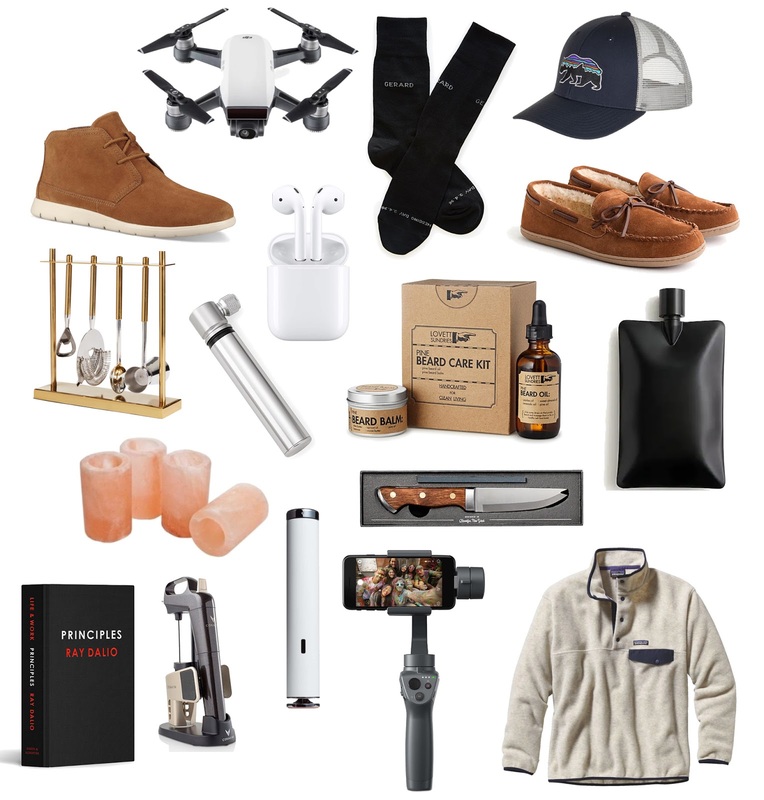 If you want to see my men's christmas gift guide from last year, there are some great items there too. I've rounded up gifts that range from high to low, and some of these are a little pricey, but honestly, I tend to spend more on my guy around the Holidays because I feel like I spend more on me every other time of year. ;) I like to splurge on him for Christmas, because he never buys himself anything and well...everything he likes IS expensive. Ugg Chuka Boot: Brandon has these and is obsessed with them. He is SO picky about his boots, and we had been on the hunt for a pair for a while. When we came across these, he instantly loved them for the style and comfort. If you're looking to gift your guy a new pair of boots, I highly recommend these. DJI Drone: A little pricier on the list, but well worth it. If you are looking for a splurge piece that your guy will love, I highly recommend these DJI drones. Brandon has bought two (we use them for Real Estate marketing) but I know other guys that have bought them and love them. There's really nothing better for a guy than being able to go outside and fly these things. Don't ask me why. I've linked multiple highly rated options in different price ranges below, allow the DJI is definitely the most advanced/professional version. Personalized Socks: I know, I know. It's socks. But these are personalized, and not only would make great stocking stuffers for your guy, but also it's like a gift for you when you are pairing the laundry. I learned that last year when I stuffed Brandon's stocking with Happy Socks, and quite frankly, it's been the gift that keeps on giving to both of us. Patagonia Hat: You really can't go wrong with a Patagonia hat, if you ask me. Every guy I know that has one, wears it all the time. It's an inexpensive and super versatile gift. Apple Air Pods: Everyone I know that has these swears by them! I feel like they are a safe gift that would work for just about anyone. Bar Tool Set: Any cocktail lovers out there? This bar tool set has all the things needed to whip up any yummy libation. Plus, it's stylish AF so it's a win/win for your countertop. Pocket Bike Pump: I can see this one making its way into Brandon's stocking for sure. He is an avid bike rider, and if your guy is too, you can't ever go wrong with bike accessories. Beard Care Kit: If your guy is obsessed with his beard (I know a few guys who are!) this would be a great self care gift for them. Sure, you'll have to concede and pretend that you actually love the love they have for their man hair, but hey...they'll be happy. Liquid Body Flask: This sleek flask is handcrafted in Brooklyn. If your boo is proud to be an American, and loves his whiskey, you cant really go wrong here. Himalayan Salt Tequila Glasses: I absolutely love Uncommon Goods for unique gift ideas, and they didn't disappoint with these Himalayan salt tequila glasses. You all loved my Himalayan salt grilling plank from last year's gift guide, and I feel like this is like that but the 2.0 version. I mean...plus tequila. Bartender's Knife: I genuinely have no idea what this is used for. When it comes to mixology, I know how to cork a bottle of wine and pour it into my glass, and that's about it. Ok, ok...I do make a cocktail every now and then, but this seems next level and all the bougie. If your guy is an aspiring at home mixologist, I think this would be a dope gift. Plus it comes in a BA case, so there's that. Principles Book: You can't go wrong with a good book and I've heard amazing things about Principles by Ray Dalio. It's filled with unconventional life and business principles by one of themost successful hedge-fund manager (he's worth 19 billion!). It will definitely be making an appearance in Brandon's gift section on Christmas morning. Coravin: Looking for a unique gift for your wino? Everyone swears by the Coravin because it allows you to sample bottles of wine without opening the whole thing. It's great for someone who collects expensive bottles or only wants a glass at a time. Sous Vide: Have an aspiring chef at home? (I'm jealous!) This sous vide will be a hit for your guy that loves to cook and appreciates a perfectly prepared piece of meat. Osmo Gimbal: I got Brandon one of these for his birthday and he loves it. It stabilizes all videos on your iPhone and makes it super smooth. You could even run with it and it would be stable. Brandon just informed me that they came out with a pocket version that literally just dropped this morning on the DJI website. Pullover / Jacket: When all else fails, you can't go wrong with a stylish new piece for your guy. I love anything by Patagonia but also found some super cool budget friendly pieces below. Hope you guys like these Christmas gift ideas for men! See anything that you think you'll buy? If you have any ideas, I'd love to hear them too! Also, please feel free to share my posts on your social media and tag me. I love knowing when you guys like what I post and that's a great way for me to get your feedback! Great guide! The jackets are a great idea. I agree! You can't go wrong there! MEn ARE so hard to buy gifts for! This is a fantastic gift guide though, thank you for all the ideas! So glad you liked it babe! So many good choices! My husband has been dying to get a drone - I'll have to check this one out! You would make his Christmas if you got him one!! These are great gift ideas, thanks for sharing! I always find guys so hard to buy for! Oh dang! I miss summer weather! Yes I did! Too cool! Love your list dear. Can't go wrong with any of these.